lets customers pickup their orders from your store. Installing the Store Pickup App will give your customers the ability to collect their order from your store, rather than have to pay for shipping. It seamlessly appends to your cart and gives you the option to require a date, phone number and name for the pickup as well. The app adds a button to your cart that customers can select to choose if they want to pickup their order. If selected, we automatically add a 'Store Pickup' product to the customers cart. This makes the order match a pickup only shipping option. The customer's pickup date, name and phone number are all appended to the order attributes so you can keep track of pickups easily. Once you've installed the App from the Shopify app store, most of the code will already be installed in the background. There's just two things you have to do to get everything working. These steps are described below, but in case you are not tech savy you can contact us directly by clicking here, I'll request limited access to your store and make all the necessary updates for you. The app uses shipping rates to offer the pickup in store option to customers. 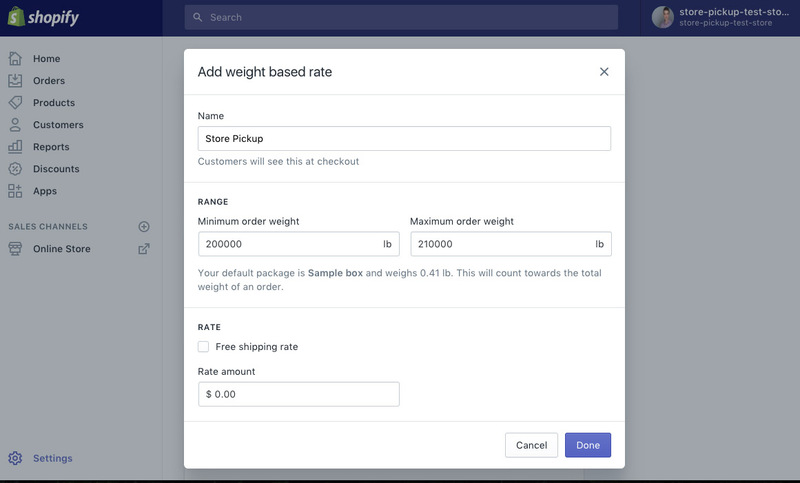 For pickups to work properly, you will have to create a weight based shipping rate. Navigate to your shipping settings. Add a name of your choosing to the shipping rate such as "Store Pickup"
Click "Done" to save your new shipping option. Using shipping rates gives you greater control over price and which areas you want to offer pickups. If you have particularly large items that might not work with this system, contact us to discuss an alternative approach for your store. 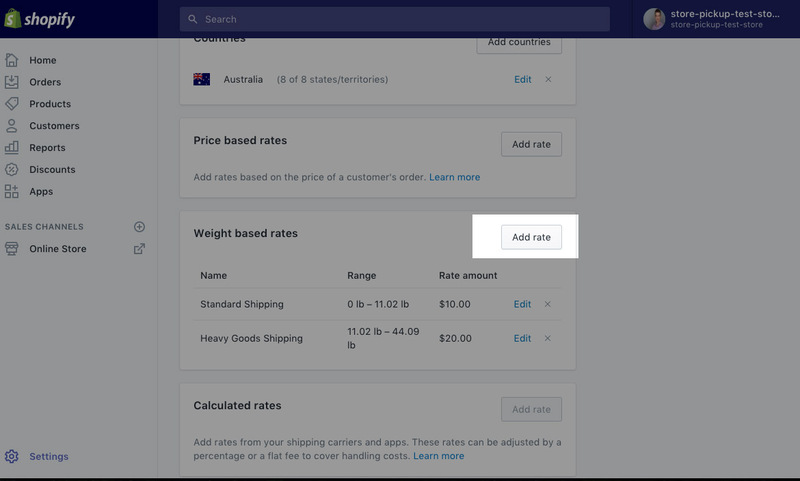 Navigate to "Settings" section of your store and select "Checkout"
Scroll down to "Order processing" and disable the checkbox where it says "Use the shipping address as the billing address by default"
That’s it! Your pickup should now be visible in the cart with the default settings. You can now add settings and stores. In case the option is not displayed on your cart page, make sure to set your cart page settings to work as Page. If still you encounter problems, contact me directly, I'll request limited access to your store and update all the necessary settings for you. Most stores will have a collection that displays all of their products available at /collections/all. Typically you don’t want the Pickup Product to display here. Add a price to charge for pickups. This can also be done by charging for your shipping rate, however charging for the pickup product as opposed to shipping makes it clearer to the customer (having to pay for shipping when they are picking up can be confusing). Add a product description that can explain your shipping policy and the process behind it. Create a digital download that gets emailed to a customer when they have elected to pickup. Handle. This should remain store-pickup-app. We use the app handle to reference the product so we can automatically add and remove it from the cart. Weight. The Pickup Instore product has a deliberately high weight. 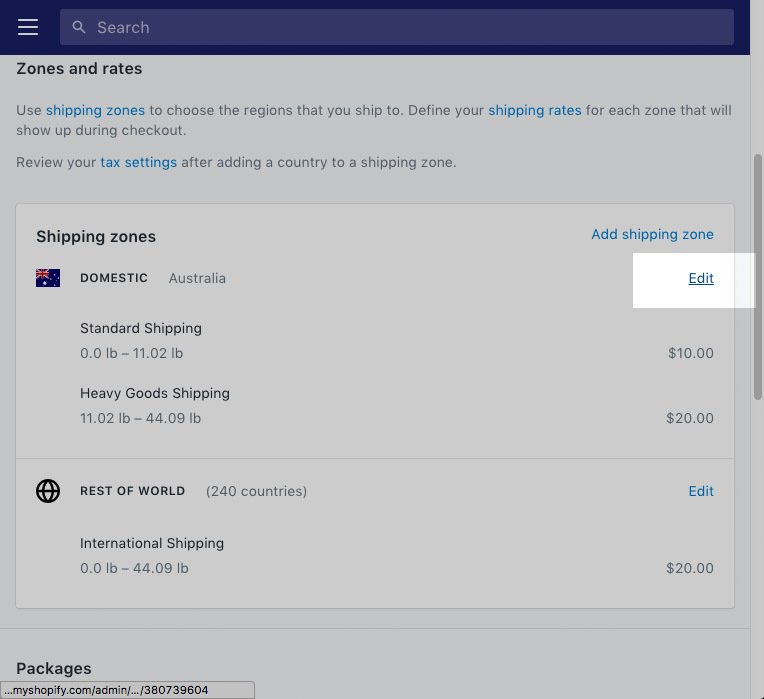 This is a work around for Shopify’s shipping methods without needing to use carrier-calculated shipping which isn’t available to all Shopify stores. If having this high weight product will impact your store (for example you have items that weigh hundreds of kilos, contact us to talk about a workaround). Under “More Actions”, click “Add Digital Attachment”. Now when your customer selects to pickup their order, they will automatically receive an email with the digital attachment. This allows you to provide instructions such as your store hours, your address and details on any policies you have such as requiring photo ID or for returns. There are two ways you can charge customers for having their order held to be picked up. Edit the shipping rate. Under Settings -> Shipping you will find a “Store Pickup” shipping rate for orders weighing 10,000 - 20,000kg. You can edit this rate to adjust the “Rate amount. Edit the Pickup Instore Product (Recommended). The Pickup Instore product is automatically created in your cart when the app is installed. This product is added to the customers cart whenever they have elected to pickup their order. You can change the price of this product just like any other product. Editing the pickup instore product is recommended. Customers might find it confusing that they are being charged for shipping when collecting their products and that the Pickup product in their cart is free. This will ensure all traces of the Store Pickup app are removed. To make you pickup process extra clear to customers, you can add a message at the end of the checkout process for customers who have selected Pickup as their shipping option. Shopify have a guide on how to add a custom message to your checkout here. Please mention also what is your store url.